That’s not even counting the transactional shipping confirmations and informational blog post notifications. Or all the work-related newsletters I have sent to my address at Moz. I do not open most of this email. In fact, preparing for this blog post, I’ve had a really fun time shunting it off into a folder called “content examples.” But receiving so much email is an excellent opportunity to think about what motivates me to open and email, what doesn’t, and what really annoys me. It’s also given me the chance to think about the various types of email subject lines and how we could all be using them better. 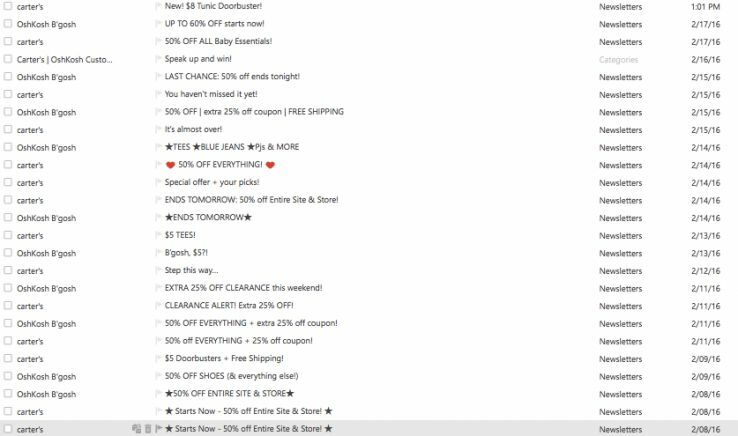 So how do you, as a savvy email marketer, stand out in your customer’s amazingly crowded inbox? I’m here to help you do just that. First we’ll briefly cover the different types of email. Then we’ll talk subject lines and take a close look at how two very different companies — Carter’s/OshKosh B’Gosh and Moz — compose subject lines and what you can learn from both. Before we get into subject lines, it’s important to do a brief overview of the different types of emails, because different types of email require different things from a subject line. Informational emails are educational. This doesn’t mean that they have a lesson plan attached, but it does mean that they’re geared to tell a reader something they didn’t already know. Change the logo on your mobile app? Send an informational email. Publish a new blog post? Send an informational email. Updating a user on how many airline miles they have or that a new report is ready? You get the idea. This particular newsletter tells me all the things I need to know about what’s happening in the publishing industry. They have the unsexiest subject lines ever, but their content is valuable enough that I open the email anyway. Another favorite newsletter is the Moz Top 10. More on that later. Yay! A new blog post! There are other ways to receive updates about new blog posts, but some of us are old fashioned and we are talking email here. What has the Park Service been up to in this, their centennial year? I’m so glad you asked. There’s an email for that. I signed up to get the latest nonprofit jobs in Seattle emailed to me sometime around the time I graduated college. In 2001. Dear Idealist keeps on sending me that report. Every day. That’s a lot of emails, but they must be doing a good job because I haven’t unsubscribed yet. Did you spot the red herring? That email from Amazon, while containing an offer, is also a triggered email. Amazon is really good at triggered emails. More on that below. According to MailChimp, transactional email is “email sent to an individual based on some action.” That could be anything from a new customer welcome email to a drip campaign a reader signs up for. In the case of Amazon, I was looking at that steam cleaner and added it to my cart as I consider it. Actually, I added it to my cart to see if they’d add it to my daily deals (because they are just that good at tracking). No luck yet, but I’m patient. Most transactional and triggered emails are also emails that your reader is looking out for, so we’re not going to worry as much about their subject lines. As long as you’re being clear, you’re probably fine. Now that you have a really good handle on the types of email you can send, it’s time to think of the style of selling that particular email. 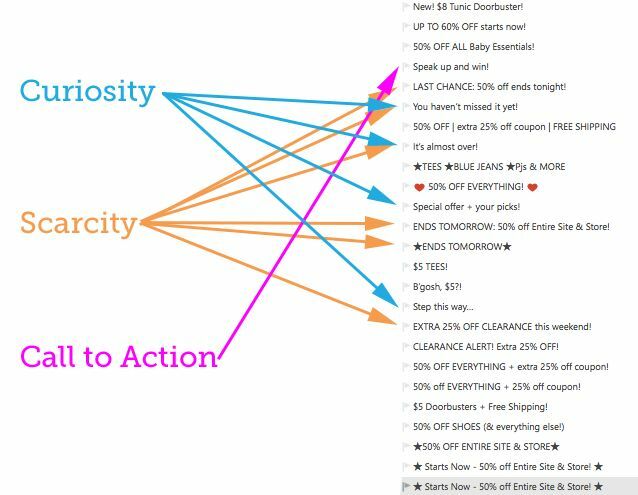 Keep in mind that although we marketers like things to align in predictable categories, some of the best email subject lines often fall into more than one of the following categories (ooh! cross-genre subject lines!). The direct, straightforward, unadorned subject line works for a company like Wolferman’s which prides itself on quality baked goods. If the information or deal is interesting enough, it appeals to a wide range of people and will never offend anyone. Notice that both of the playful subject lines here use pop culture references? That’s not a necessity (and can be dangerous if you’re too oblique), but these references can be a great way to tap into a reader’s memory and call upon all the images that your referent conjures. And I think I over-opted-out. As discussed above, Amazon is another personalization rock star. They’ll send you triggered emails tailored to items you’ve browsed, items you’ve bought, items related to items you’ve bought — and it’s all right there in the subject line. However, personalization can go wrong if you’re acting on bad information. No, I did not give Classmates my correct name when I registered over a decade ago. As a result, their personalization doesn’t pull hard at my subconscious. Instead, it gives me a good giggle. Humans are hardwired to respond to scarce resources. Whether that means “There are only a few tickets left!” or “This offer expires in four hours!”, letting your email recipients know that something is limited can be a good way to get them to take action. Most frequently used by political parties (or so it seems right now), the call to action (CTA) subject line literally calls the recipient to take an action. The “RE:” here is extraneous and annoying, but the CTA here works. I get a lot of similar emails that tell me to contact my senator or sign a petition. The CTA-type subject line also works for marketers. This email from Rejuvenation is a reminder, a call to action, and (if you read down the line far enough) an offer as well. You could invite your subscribers to “Come into the store for a special discount” or the classic “Tell us how we’re doing.” Both are calls to action. Different audiences respond to different things, but to my mind both of these come off as gimmicky. I notice them but they almost never compel me to open that email. And when my local art museum started using them I died a little inside. Just remember that if your customer is reading your email on mobile (which 65% of people do), they can likely only see the first 50 characters of whatever you write. So I hope L.L. Bean wasn’t telling me there were 70 free shirts available, because I’ll never know. As a new mom who does most of my shopping online, I get a lot of email from Carter’s/OshKosh B’Gosh. Sometimes I get several per day. Which makes Carter’s/OshKosh B’Gosh an easy case study for us to put all our email subject line knowledge to use. First of all, that’s a lot of email. Granted, they are writing to an audience (me!) who isn’t getting a lot of sleep, and, as a result, has no short-term memory. But it is a little smothering, and I sometimes run a little animated clip through my brain of the Carter’s email team doing battle with the OshKosh team over who can send the most email the fastest. It isn’t pretty and invariably I lose. 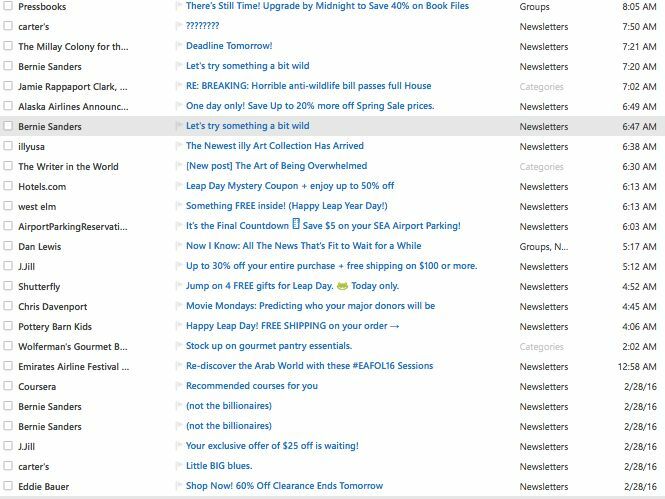 We can chat about whether this volume of emails is effective; I did, after all, admit (just a few paragraphs ago) to a large number of purchases. But that’s more because I’m caught up in their rewards cycle and because at the end of a day full of marketing and mothering, online shopping is all I have the energy for. I might have a problem . It’s a step in the right direction? Remember that it’s important to keep your customers engaged. Using a wider variety of subject line types and testing new territory can be a great way to do that. If I had a girl. Carter’s has enough information about my browsing and purchase history by now to know that I have a son. They might be confused about his age because I’ve been stockpiling outfits for when he grows, but he is a boy. And no matter how gender neutral I try to be, I’m probably not going to outfit my son in dresses anytime soon. The lesson: We’re digital marketers. We have A LOT of data on our customers. If you aren’t already using that data to customize your email marketing, impress your boss by asking how to start. OMG I’m so sad I missed the 50% off sale this weekend. Wait, today everythings’s 60% off? Promotions are awesome. They get your customers’ attention. The move old inventory. They increase your bottom line. And time-limited promotions are a very good way to tie into that fear of missing out that makes scarcity subject lines so effective. But when I’ve been a customer for less than half a year and I already know the sale gets better and better and better the longer I wait, you’ve lost all the power that scarcity offers. Instead, I feel duped if I bought at the higher price and fail to be motivated by email subject lines that mostly tout the latest deal. Be strategic about the strings you’re pulling with your subject lines. They’re a lot more effective that way. Am I being unfair to Carter’s and OshKosh? Maybe. I’m sure that they have thoroughly tested their subject lines and related open and clickthrough rates. And let’s face it, creating emails at that volume while trying to maintain freshness is hard. Either way, there are some good lessons to be learned here (or in your reactions to your own inbox). Now let’s take a look at how well I’m doing in writing subject lines for the Moz Top 10. The Moz Top 10 is a newsletter, so we’re obviously going to take a slightly different tack than your average retailer (at least at the sales level — don’t underestimate the power of a strong newsletter for your top-of-funnel content marketing), but there is still some insight to be gained from what works and what doesn’t. To understand the difference, I analyzed a year’s worth of editions. If you’re counting, we split test five different subject lines (each going to an initial run of about 15,000 readers) for each bi-weekly edition. That’s about 130 different subject lines. I’ve split out some of the most instructive weeks below. Note: This is not a controlled experiment. Things other than tone change from subject line to subject line in a given week, and if you try to compare open rates from one week to another, you’ll be lost (bonus points if you can pick out the edition where everyone was on vacation). This chart is representative of the most common trend across Moz Top 10 subject lines: piquing a reader’s curiosity and personalizing the subject line by using the word “you” are winning tactics with this audience. What I could do better: I’d love to personalize the email further, but we just don’t have that kind of data on this list. And I’m going to want to remember to avoid subject lines that sound formulaic. It’s not surprising that a direct headline works well for a newsletter like the Moz Top 10. In this case, the top two subject lines were directly worded. What is surprising, though, is that personalizing the subject line a little (adding “you”) actually caused the open rate to drop. This is something that bears more testing. Lesson learned: Assumptions are not always right. Test, test, test. This newsletter will expire in 10 minutes. Seriously, we don’t use scarcity much in Moz Top 10 subject lines. The chart below illustrates why. If you think we should, I’d love it if you shared your ideas in the comments on how to effectively do that. Fewer than 15% of people opened the “scarcity” edition. That’s a poor open rate even for a week when everyone was clearly out of the office. The takeaway: Write for your audience. In this case, I think marketers are so used to hearing “the latest” that it’s lost its power. Did I hate myself a little for writing the winning subject line here? You bet. Did it cause a little controversy around the office? Absolutely. Did it work? Unfortunately, yes. My trick when writing clickbaity titles is to be honest while you’re being playful. This was the week Google ditched author photos and started selling domains, so the subject line is strictly correct. It can also be misconstrued and I counted on our readers here to take this as playful rather than misleading. Their clicks said they wanted to read and our unsubscribes didn’t jump, so I think I skated through on this one. There’s a lot to learn when writing subject lines. Based on the above data, I’m going to keep trying a few tactics at once. I’ll definitely try to keep up the playful tone and personalize when appropriate. I may never use a scarcity-based subject line again, and will always strive to pique the readers’ curiosity and interest without being misleading. In the long run, isn’t that what it’s all about? Want to see how well I learn from this deep dive into email subject lines? Sign up for the Moz Top 10.